Construct a beautiful and efficient backyard coop to suit any style—from fancy to rustic—with these step-by-step instructions. 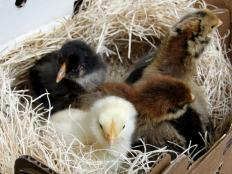 Raising backyard chickens is more popular than ever. 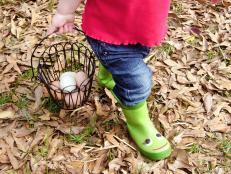 Keeping chickens is a hobby that pays off in fertilizer, pest control, companionship, and, of course, fresh eggs. 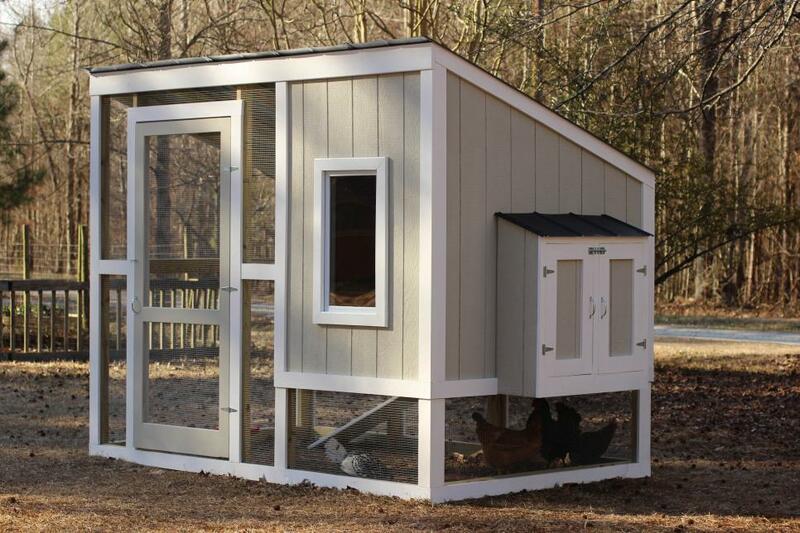 For those ready to take the plunge, it all starts with the right housing, but finding a coop that is appropriate for the flock, easy to maintain and still looks good in the yard can be a challenge. 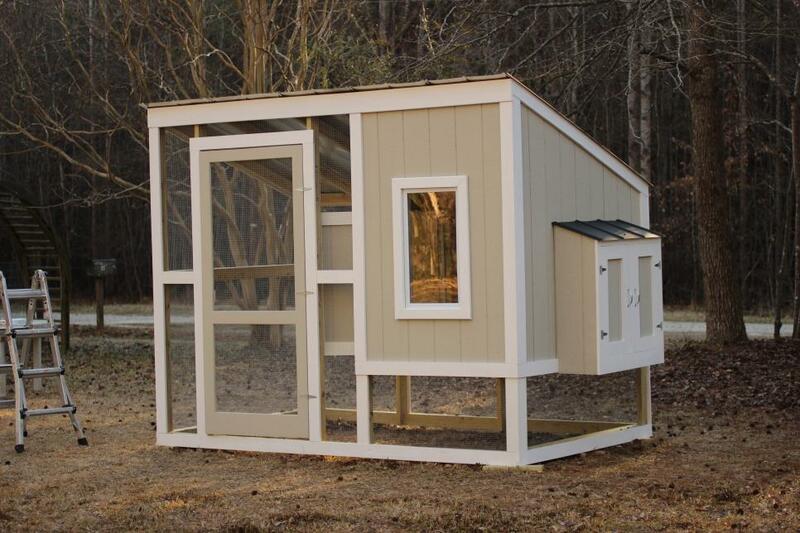 HGTVGardens has got you covered with these plans for a DIY coop and enclosed run with a small footprint to fit any yard. 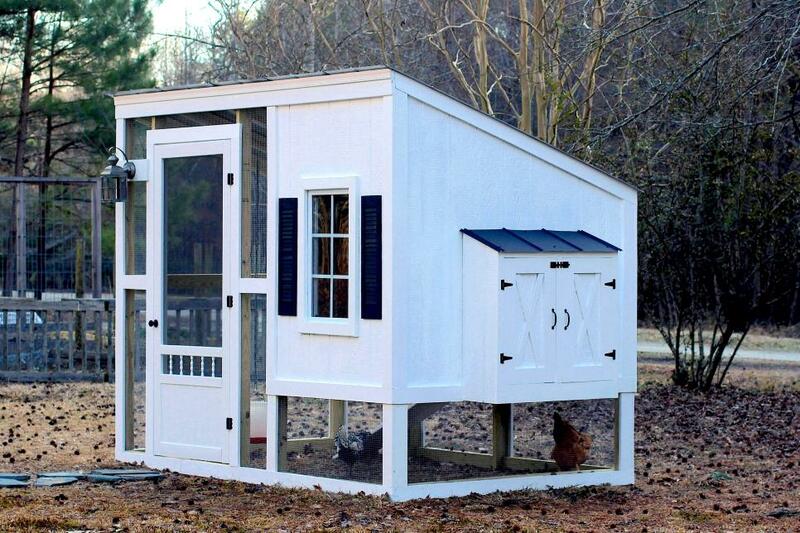 This raised-coop enclosure offers room for six chickens, a walk-in run, built-in storage, an observation window, external egg collection and a simple design easily customized to suit any style. Download our detailed plans to build your own chicken coop and explore this gallery to see this efficient design customized four ways, including a basic coop, elegant and rustic modifications and a plan to convert this sturdy structure into an attractive and spacious garden shed should a backyard chicken coop no longer be necessary. What you’ll need: 250’ 2x4 pressure-treated lumber/ 8’ 2x2 pressure-treated lumber/ 20’ 1”x1-3/4” pressure-treated lumber/ 1”x4-1/2”x33-1/2” pressure-treated lumber/ 112” 1x6 pressure-treated lumber/ 84” 1x1 pressure-treated lumber/ 15’ 3/4”x3/4” pressure-treated lumber/ 19’ 5/4x6 deck boards/ 5/8”x4’x6’ plywood/ 92” 1/4”x 1-1/2” lattice strips/ 260’ 1x4 appearance boards/ 1 roll 4’x50’ hardware cloth/ 5 26”x96” ribbed roof panels/ 5 4’x8’ siding panels/ 1 20”x33” single hung window/ 1 36” screen door/ 1 box 3/8” galvanized staples/ 1 box roofing screws/ 1 box 2” exterior screws/ 1 box 2” finishing nails/8 3” T hinges/ 3 door pulls/ miter saw/ jigsaw/ drill with screwdriver bit/ hammer/ level/ measuring tape/ square/ staple gun. 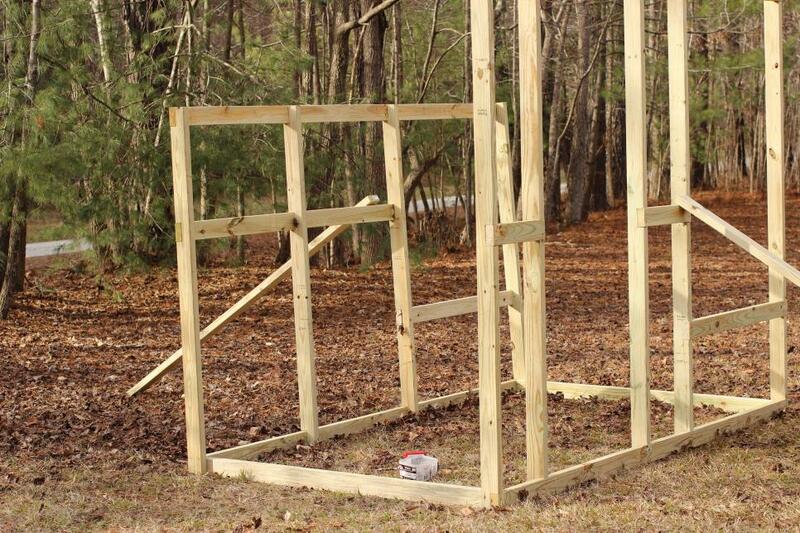 Before assembling the frame for your chicken coop and enclosed run, measure and cut the necessary lumber as shown in the detailed plans in the previous slide. 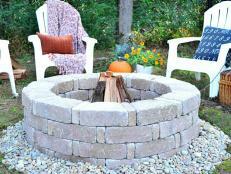 Select pressure-treated pine, cedar or other lumber appropriate for outdoor projects. 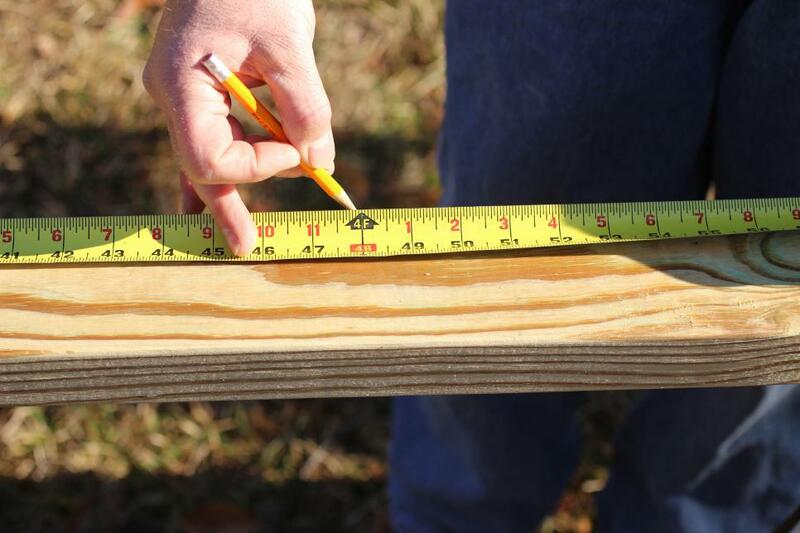 Whether you have purchased ten or twelve-foot planks, calculating cuts in advance will minimize waste. 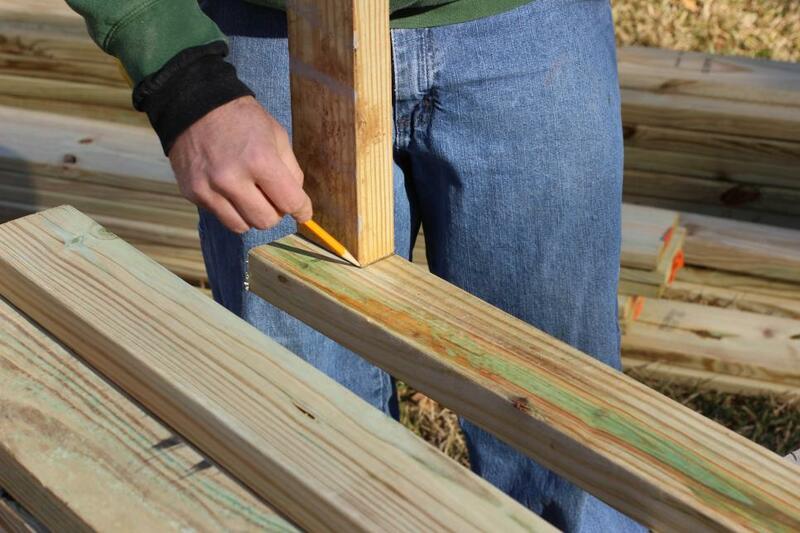 Use a length of 2x4 to mark required notches before assembly. Use a jigsaw to cut marked notches. Notching frame junctions ensures the position will be accurate and provides a level framework to which the fencing may be attached. Lay the pieces of the front and back frame on the ground in position. 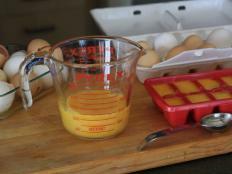 Use a square and measuring tape and confirm all spacing is correct, notches are placed correctly and corners are square. 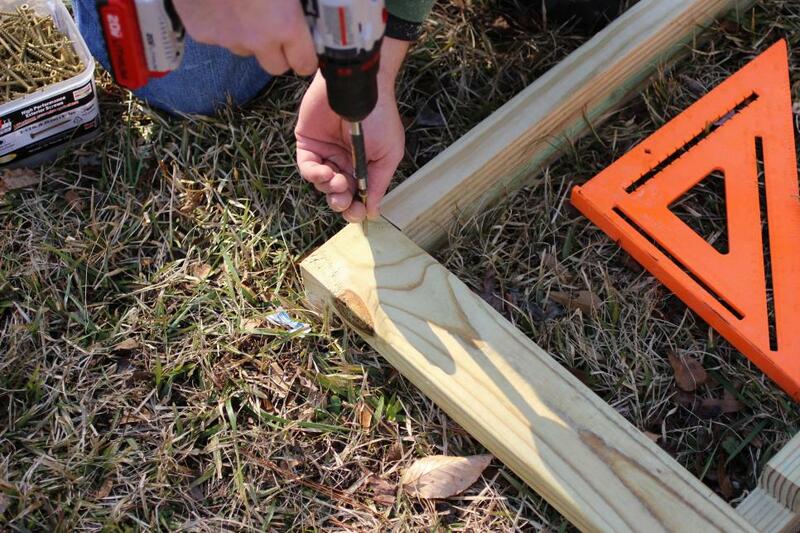 Once all pieces are in place, use 2-1/2” deck screws to assemble. 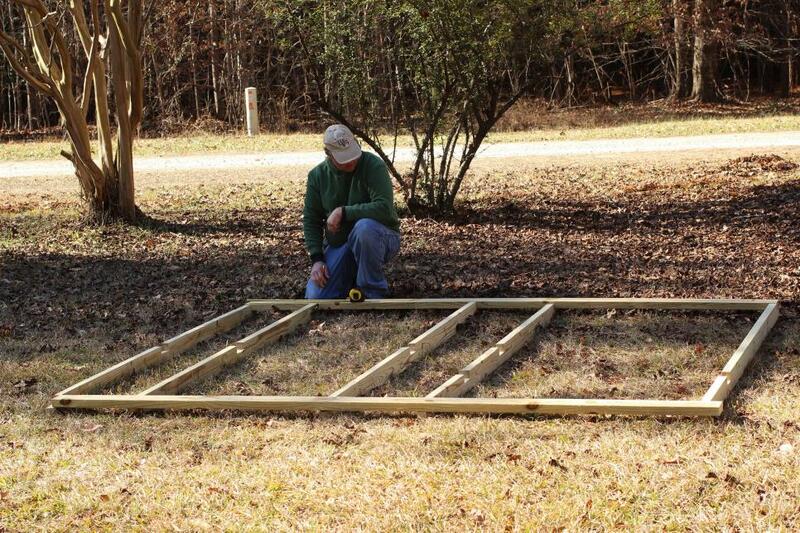 Lay two 6 foot lengths of 2x4 parallel on the ground spaced ten feet apart. Position assembled front and rear of frame in place with corners touching the ends of placed 2x4s. Lift the assembled components to stand vertically and stabilize using two lengths of 2x4 temporarily screwed in place. Have a helper on hand to make sure all sides are plumb and angles measure 90 degrees. 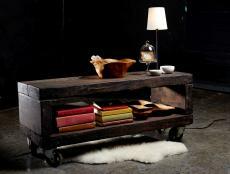 Using 2-1/2 inch screws, secure the bottom and middle side supports. Note side supports are of double thickness for stability. 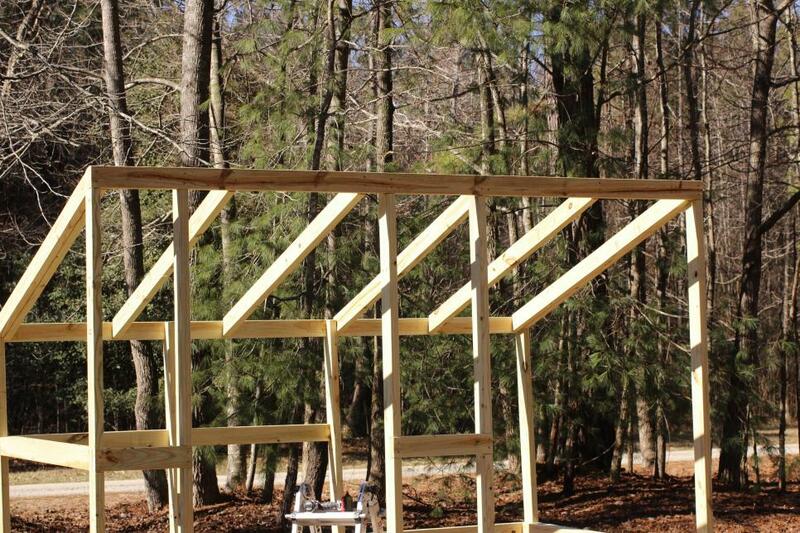 Position and attach joists at each end of the structure to complete the sides of the frame. The joist should be even with the horizontal support on the front of the structure and slightly raised at the back to create a slope even with the outside support of the back so roofing will lay flat when added. Now that the frame is complete, the temporary supports may be detached. 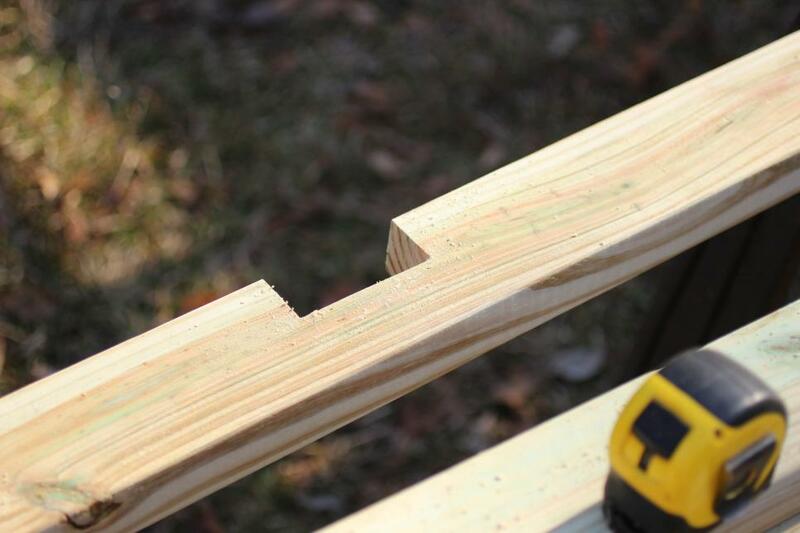 At this time, placing a piece of scrap lumber under each corner will make it easier to keep the structure level and plumb while working and when attaching bottom trim later on in the process. Position and attach four interior joists, evenly spaced and matching the pitch of the side joists. 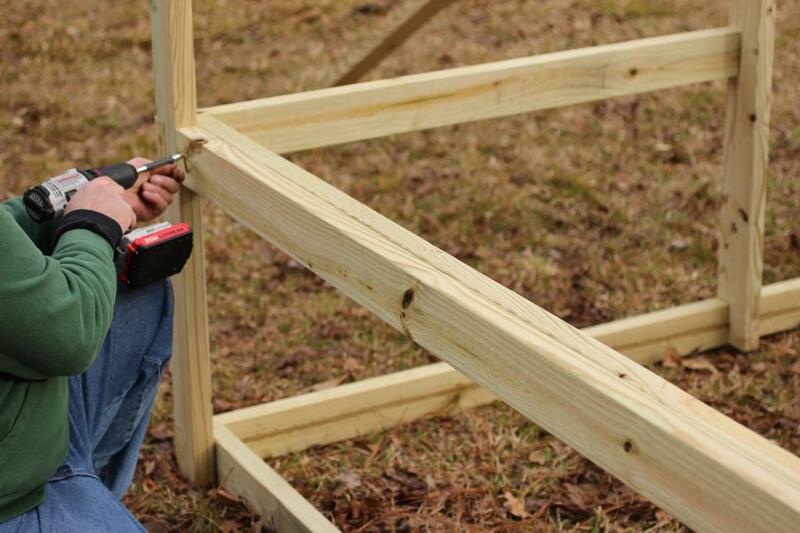 Use a saw to trim vertical posts on the front of the structure to match the slope of the joists. 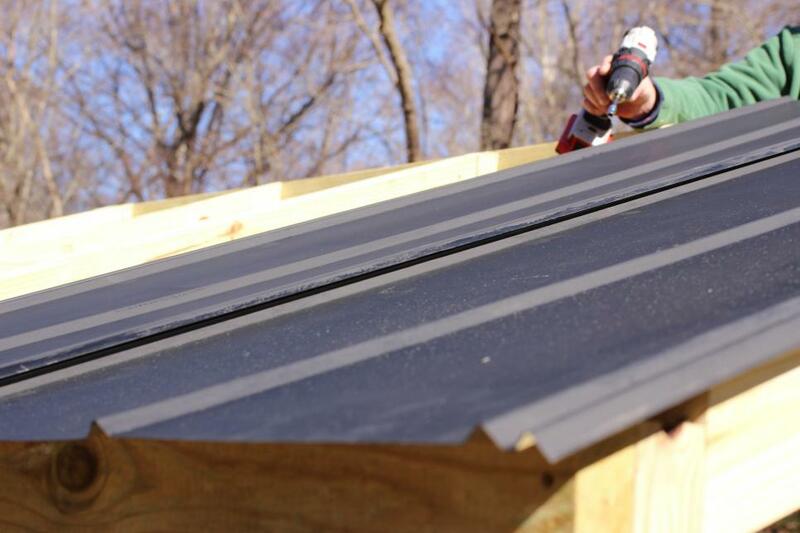 This cut will allow roof panels to lie flat when attached. Roofing is available in corrugated or ribbed styles make of galvanized steel or polycarbonate in a variety of colors. Here we use ribbed steel roof panels painted black. 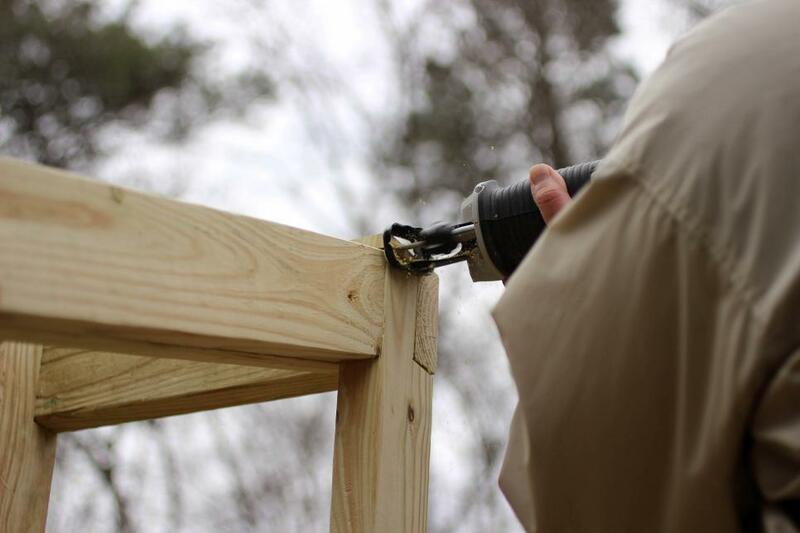 Cut panels to length and start at one end to attach panels one at a time using roofing screws. Allow an overhang of 1-½” on the sides, 4 inches at the front and 2-1/2 inches at the rear. 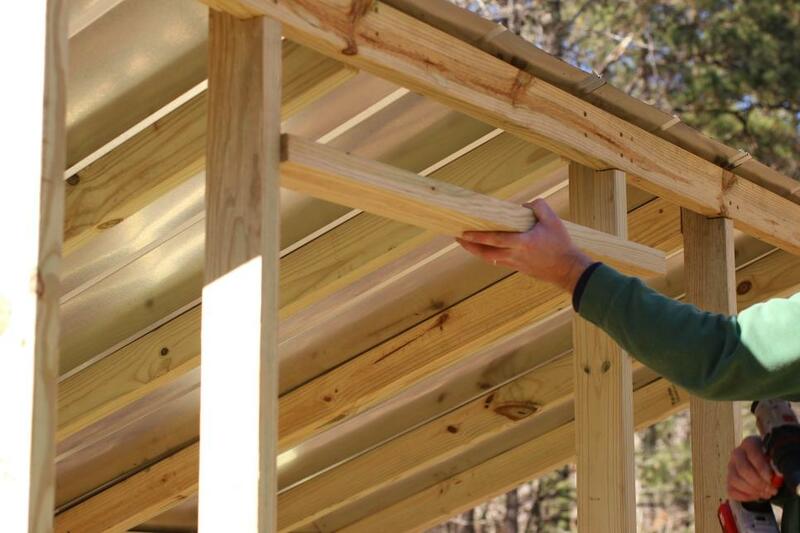 Make sure the roof is square with the frame when attaching the first roof panel. 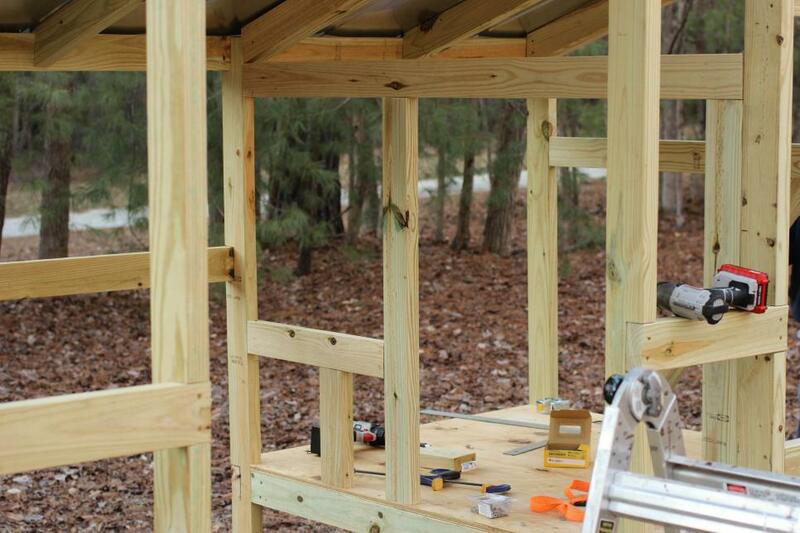 Use raised ribs to overlap each panel with the previous and continue until all five panels are in place and secure. 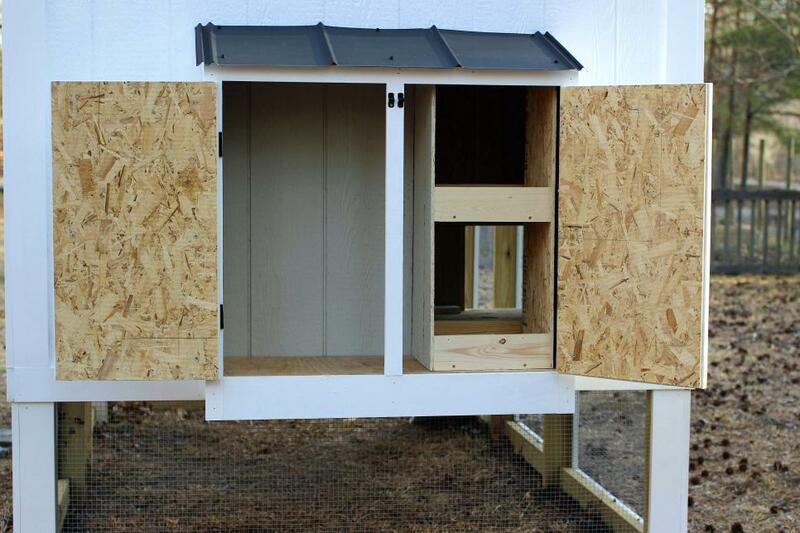 Place and attach elements of the inside face of the coop enclosure. 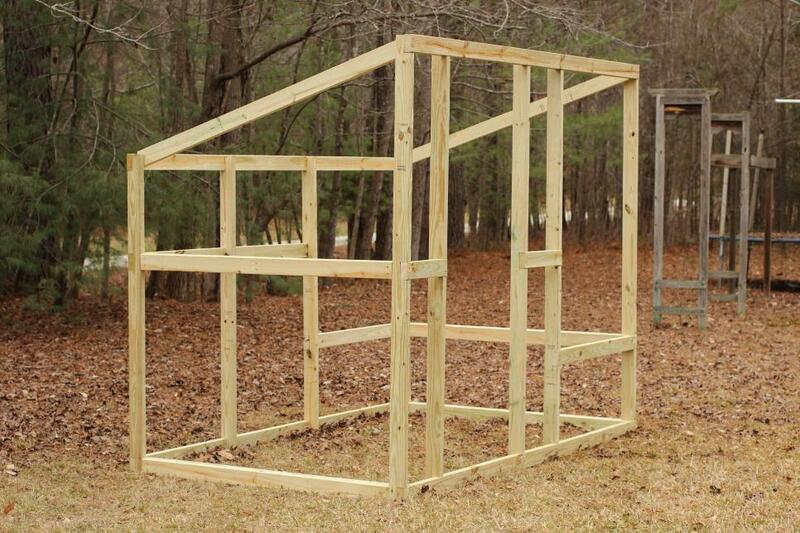 Once enclosure frame is complete, place and secure the floor of the coop. A healthy flock required four square feet of coop space and ten square feet of run per chicken, which can result in a sprawling enclosure. 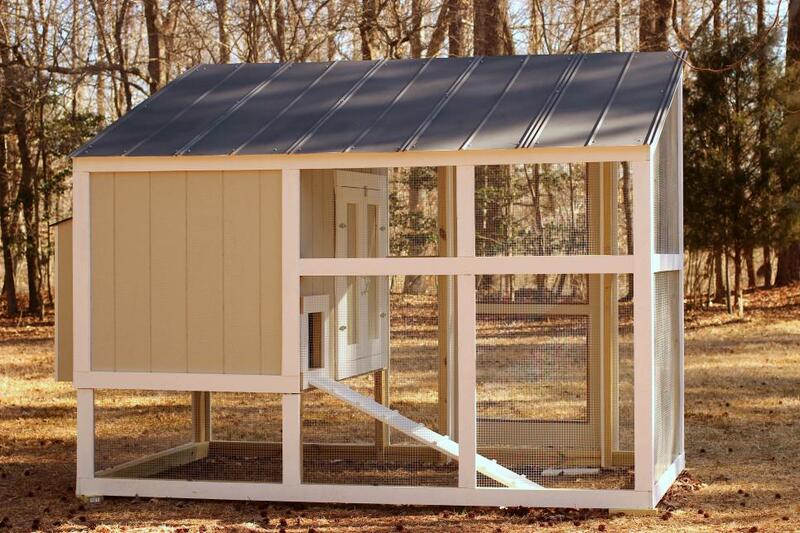 The elevated floor of this coop design allows space below to serve as run space for the chickens, reducing the footprint of the overall structure. Position and attach header at door opening. This can be adjusted, as needed, to accommodate the height of chosen screen door. Cut panels of hardware cloth to fit run and attach to frame. Use a helper or clamps to position and secure using staples. Make sure panels lie flat and have no gaps. 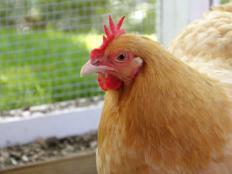 Despite its name, chicken wire is not the best choice for the enclosure. Although it would likely keep chickens in, the weak wire and loose weave is no match for a hungry predator. 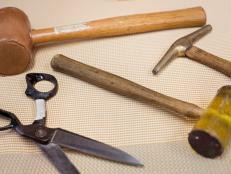 Instead, use ¼” hardware cloth and use plenty of staples to keep it secure. 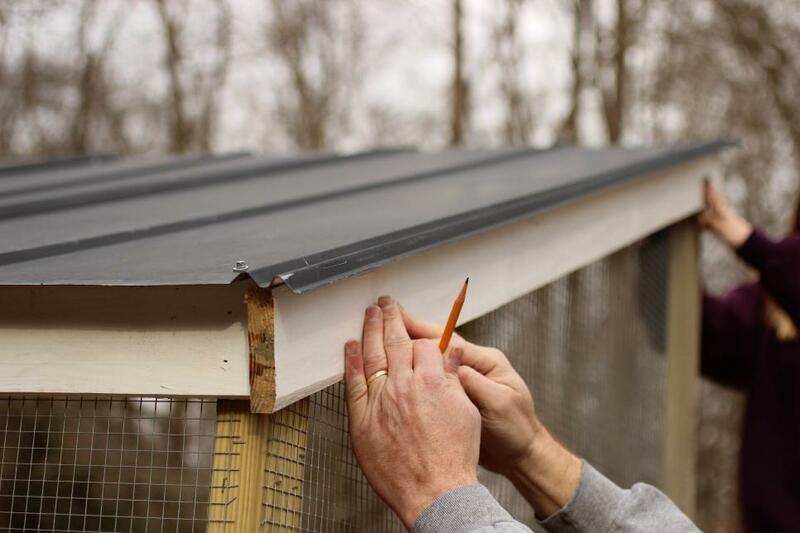 Measure, mark and cut siding panels to enclose the coop portion of the structure. Panels may be cut and positioned to mark openings for the window, access doors, chicken door and nesting box pass-though and removed to cut using a jigsaw. Retain the pieces removed for the construction of access doors and nesting and storage bump out. 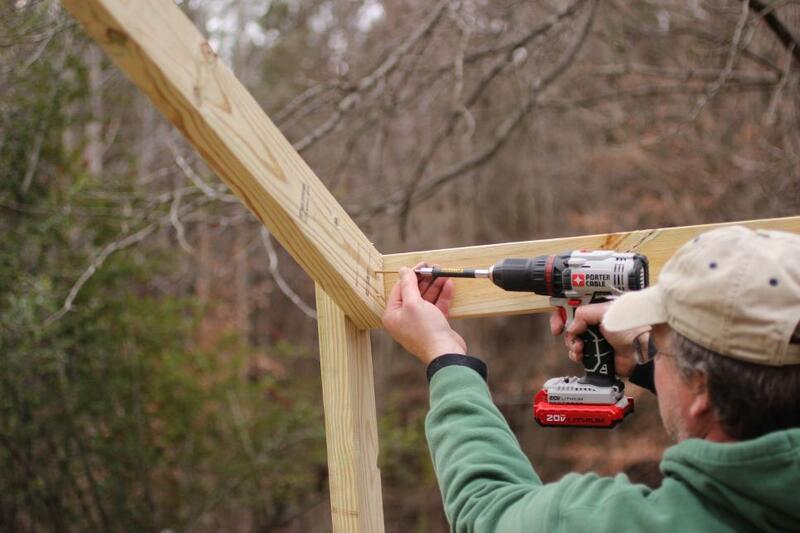 Reposition siding panels and secure using screws. 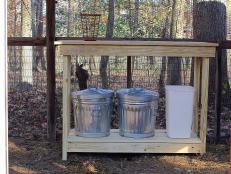 The bump out makes it easy to store chicken feed and allows eggs to be collected without entering the coop. Once bump out has been assembled, attach to the side of the coop with the right side lined up with the pass-though opening in the siding. The nesting boxes are not attached to either the bump out or coop, but fit snugly and are easily removed to clean or to change bedding. Hinges and door pulls may be selected by preference. A barrel bolt at the top of each door is recommended to keep out predators. 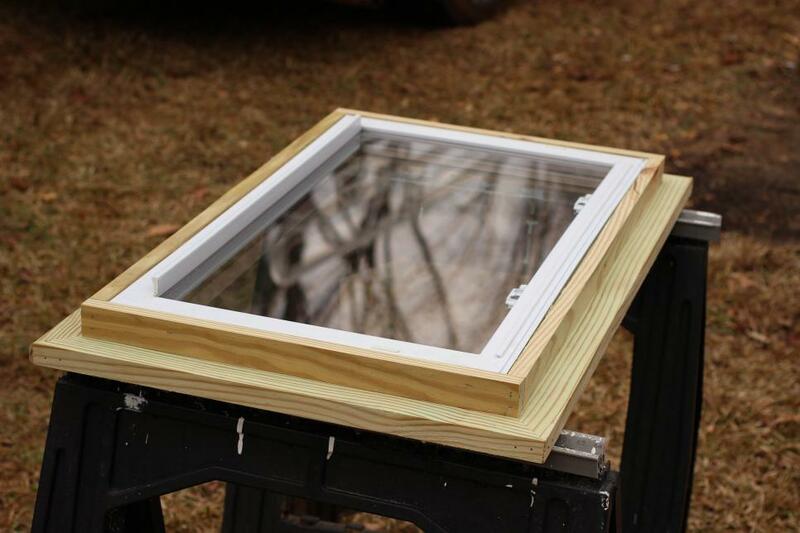 If your window does not have a prefabricated frame, one may be created using 1”x2” lumber. Add face trim, if needed, using 1”x6” lumber. 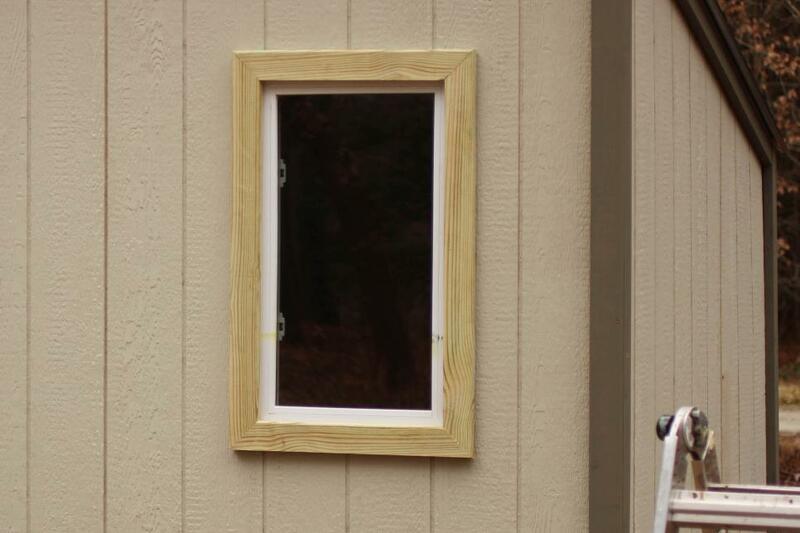 Secure single-hung window in the opening on the front of the coop. These plans are written to use a window 20”x33” but are easily adapted to fit a larger or smaller window. 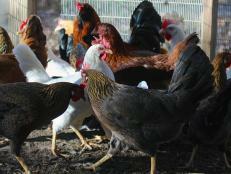 The window makes it easy to watch your flock inside the coop and provides plenty of light. 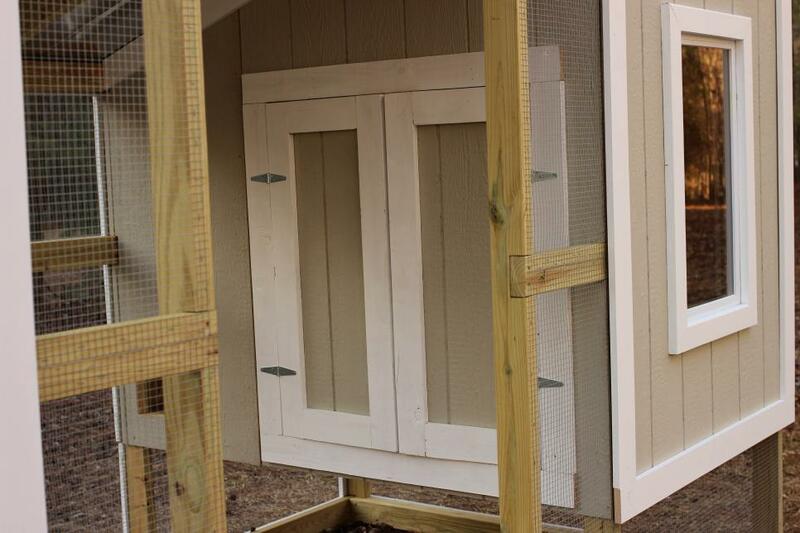 These wide doors are attractive and provide easy access to the inside of the coop for cleaning or access to the chickens within. Use the siding cut from this opening in the assembly of the doors. Hang doors with 3” hinges and add a barrel bolt at the top of each door (not pictured) to keep doors secure. 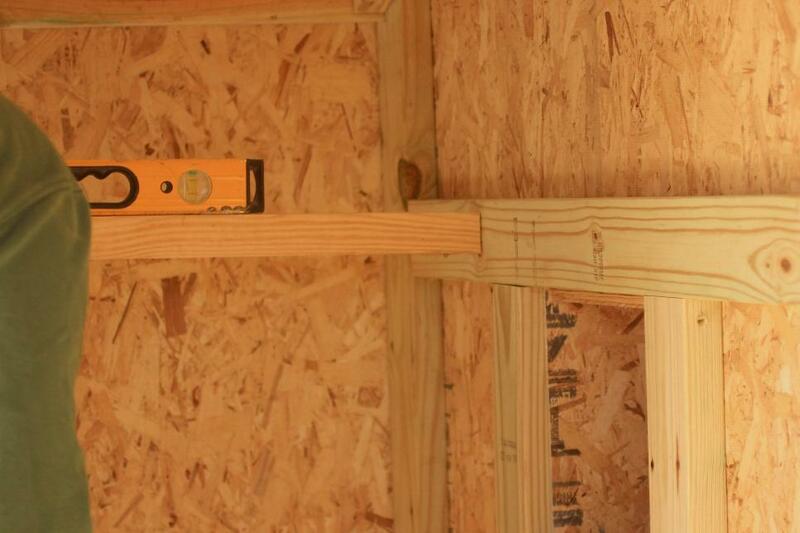 Measure and cut trim to cover all external corners, frame lines and to border all openings. Attach using finishing nails to give your coop a clean, polished appearance. Hang a 36” screen door in the prepared opening. The screen typically found in store-bought doors is no match for an intrepid predator and it is strongly recommended that a layer of hardware cloth be added before installation. 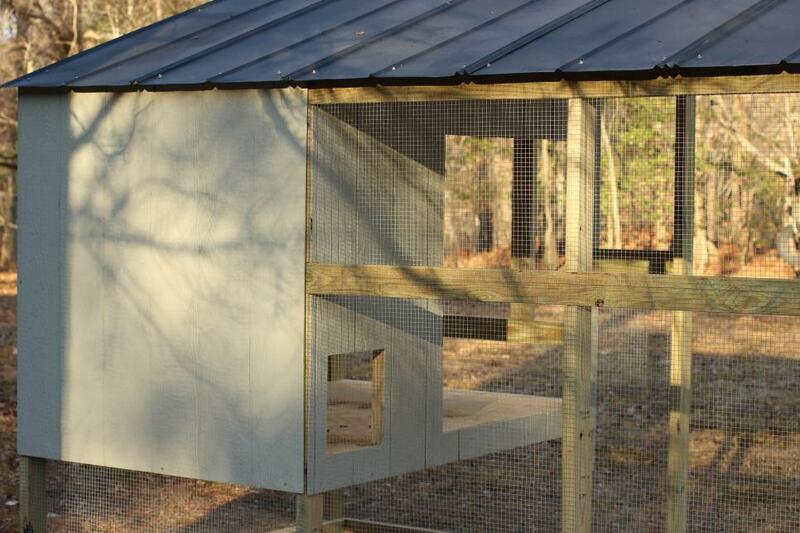 Make it easy for your flock to get inside the coop by providing a ramp with a long slope and treads. Chickens like to sleep off the ground and will seek the highest roost when bedtime rolls around. Install a roosting bar inside the coop using a 2”x2” piece of lumber attached 8” from the back of the coop higher than the nesting boxes. 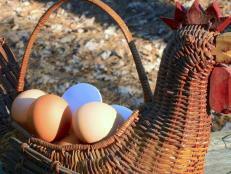 Unlike most birds, chickens sleep flat-footed, so a round dowel is not advised. 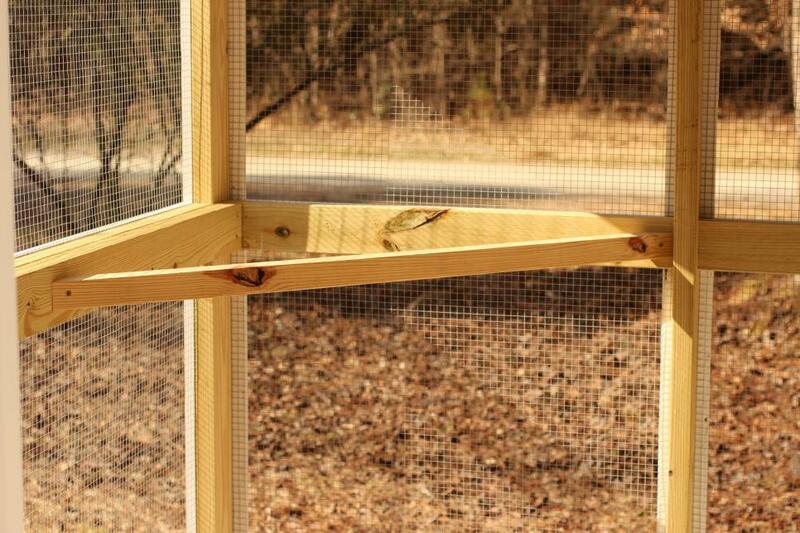 Give your chickens a place to perch in the run by mounting a 2”x2” bar at the outside corner between the middle frame supports. To give your run a more natural look, a wide tree branch cut to length may be substituted. 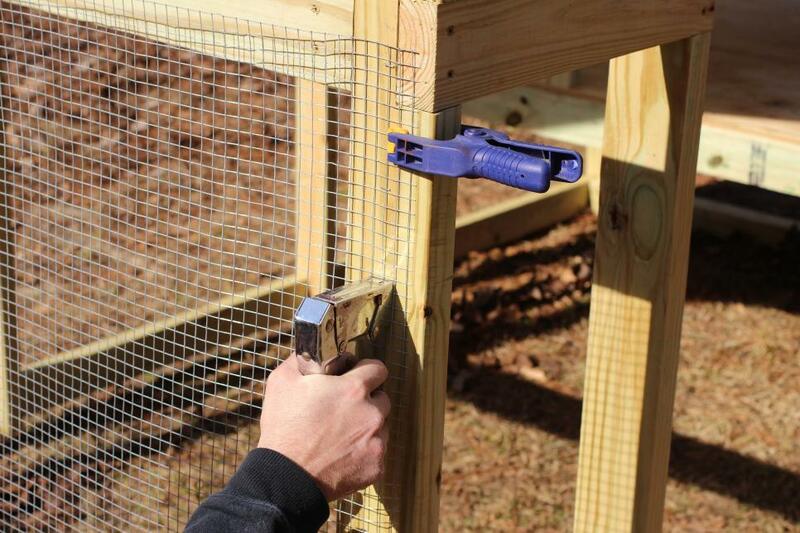 Remove the props under the corners and use ground anchors to secure the coop in place. A ground barrier is strongly recommended to prevent predators from digging their way into the enclosure. 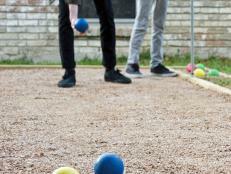 To create a ground barrier, bury a course of hardware cloth 12” deep around the perimeter. 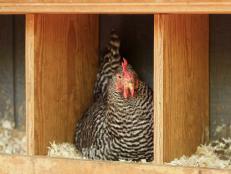 Add a hanging feeder and waterer to the run, fill the nesting boxes with bedding material. If the ground at your site is rocky or otherwise inhospitable, consider spreading a layer of sand, dirt, straw to the run for the comfort of your flock. 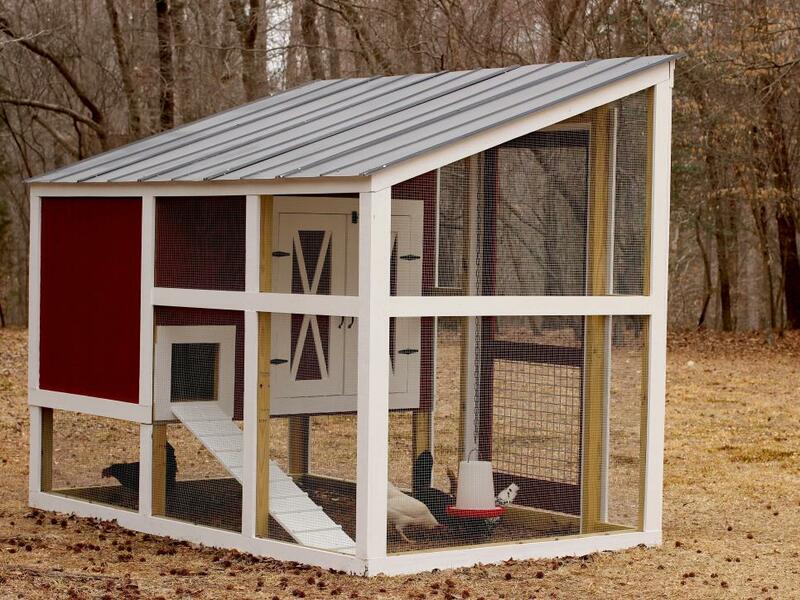 Once the amenities are in place, your enclosed coop and run is ready to house up to six chickens of any size or breed. 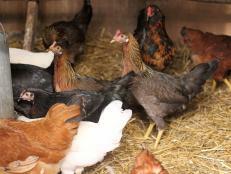 If raising only bantam breeds, the coop may support up to two additional birds, but resist overpopulating the coop, which can result in problems regarding the health and harmony of the flock. 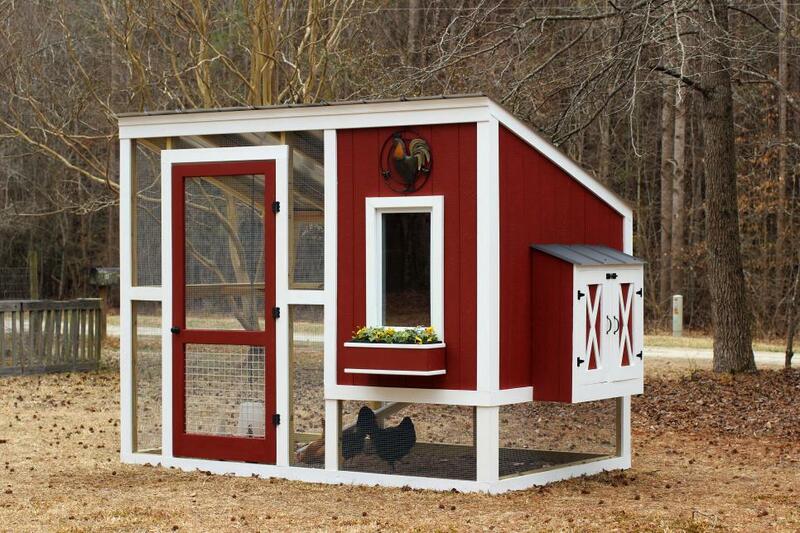 This coop is designed for the easy and efficient management of your backyard flock, but style counts! 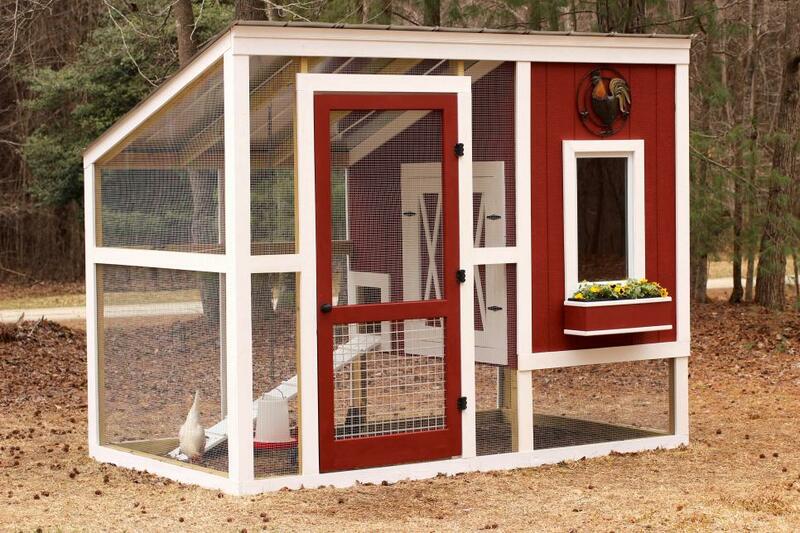 Customize your coop by varying elements such as color, door and hardware style and use of accessories. 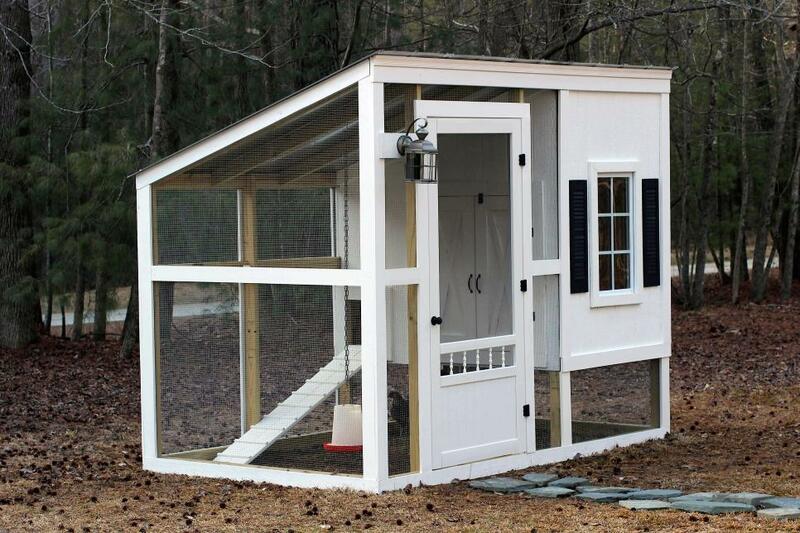 This elegant modification of the basic coop includes a fresh coat of white paint, cosmetic shutters and window grid, a new screen door with self-closing door hinges, inset crossbucks on storage and access doors and contrasting door hardware. A slate walkway and a functional coach light complete the modification. Note that the basic coop doesn’t require electrical service, put running power for a “porch” light or a single caged bulb inside the coop itself can add both function and style to a well-maintained coop. 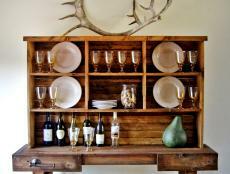 Our rustic modification incorporates elements of classic rural style. “Barn Red” paint with contrasting white trim give the coop a clean look reminiscent of farm living. 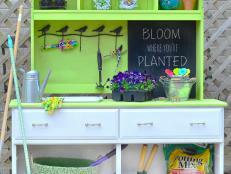 Add a splash of color with a matching window box, which cradles a standard plastic planter box for easy management. A metal grid on the lower panel of the screen door and an artistic flourish mounted over the observation window adds to the style of this modification. If chickens are no longer part of your backyard experience or a growing flock requires a larger coop, there’s no need to tear down this well-built structure. 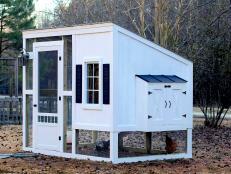 Instead, remove the coop floor and inside facing, nesting and storage bump-out and run fencing. 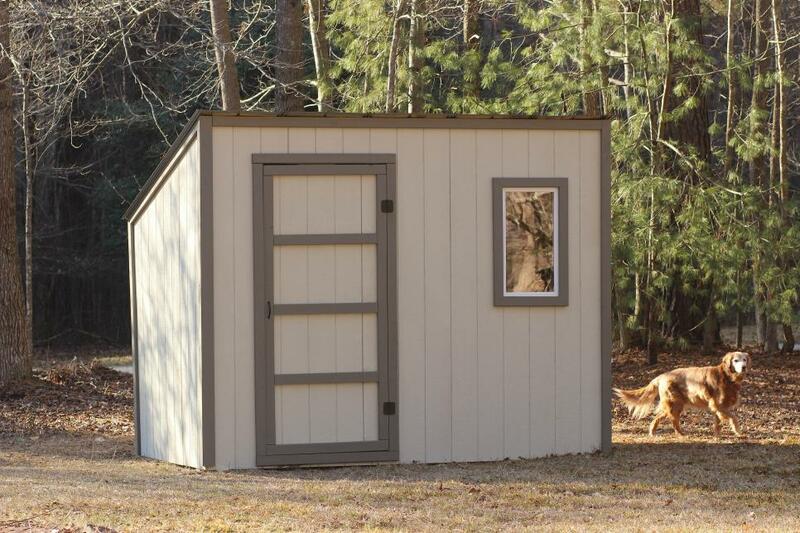 Inexpensive siding and a solid door convert the structure into a spacious and attractive garden shed to store tools, equipment and gardening supplies. Here we use 1x4 lumber and siding to create a functional door without the added expense of a store-bought door.